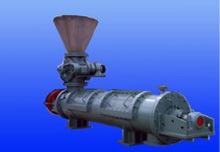 Circumgyrating Belt Type Condensation Granulators, Pelletizers are widely applied in the granulating production of raw materials whose metling point, soften point are less than 250℃, such as some rubber chemicals, some plastic chemicals, olefin, paraffin, sulphur, resin, asphaltum, Maleic Anhydride(MA), Trimellitic Anhydride(TMA), stearic acid, hot melt glue, MetaPhenylene Diamine, carbamide, etc. High Speed Gear Teeth Agitating Granulator Pelletizer HSG Series are widely applied in the granulating production of light, fine powder. If the basic particulates of the fine powder are more thinner, and the sphericity of particulates are more roundish, then the granulation effect will be better. Usually the particulates of light, find powder should had better be less than 300 mesh per inch before granulating. Some representative materials, which are suitable for High Speed Gear Teeth Agitating Granulators (Pelletizers) HSG Series, are carbon black, silica white, china clay, kaoline, bakelite powder, molecular sieve, calcium carbonate, calcium hydrogenphosphate, etc. Plain Flatdie Rollor Grinding Granulator Pelletizer PRG Series are widely applied in the granulating production of raw materials such as complex fertilizer, bio fertilizer, accessory ingredient, catalyzer, pesticide, china clay, lead oxide, zinc oxide, etc. 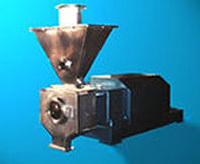 Screw Extrusion Granulator Pelletizer ST Series are widely applied in the granulating production of rubber chemicals accessory ingredients, food additives, plastic chemicals accessory ingredients, catalyzers, pesticides, coloring dyestuffs, pigments, household and personal care chemicals, pharmacy drug medicines, etc. Twin Gears Rolling Granulator Pelletizer TRG Series are widely applied in the granulating production of catalyzers, accessory ingredients, additives, household and personal care chemicals, pesticides, etc. 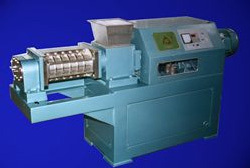 Twin Rollers Dry Process Granulator Pelletizer DRG Series are widely applied in the granulating production of capsule filling granules, pigments, detergents, catalyzers, strontium carbonate, chemical fertilizers, silica white, inorganic salts, chloride isocyanuric acid, bleaching powder, pesticides, oxides, etc. 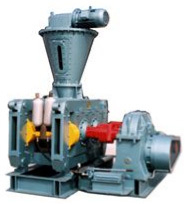 Twin Rollers Dry Process Granulator Pelletizer DRG Series are also widely applied in the granulating production ofindustrial reclaimed powder materials such as cast iron factory's dust powders, lead dust, zinc dust, aluminium dust, converter dust, filtration dust, mill dust, etc.